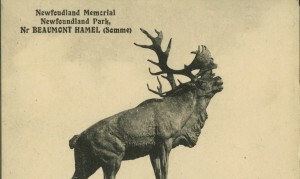 The Beaumont Hamel Newfoundland Memorial commemorates the sacrifices of Newfoundlanders during the First World War, especially those dead who have no known grave. It is the largest and most-visited of five Newfoundland memorial sites in France and Belgium. The Beaumont Hamel site was officially opened by Field Marshal Earl Haig on 7 June 1925, and is the largest of five memorials dedicated to the 1st Battalion, Royal Newfoundland Regiment. Beaumont Hamel was the site of the Newfoundland Regiment’s disastrous assault against German positions on 1 July 1916, the first day of the Battle of the Somme. The site includes a well-preserved battlefield, one of only a few on the entire Western Front. A large bronze caribou stands on a rocky outcrop above three bronze memorial tablets near the original Newfoundland forward trenches on 1 July. The tablets contain the names of 814 Newfoundlanders from the Newfoundland Regiment, the Newfoundland Royal Naval Reserve, and the Mercantile Marine who died in service during the First World War and who have no known graves. Some bodies were subsequently recovered and identified after the memorial was opened in 1925. Beaumont Hamel remains an important site of pilgrimage for Canadians, but especially for Newfoundlanders and Labradorians. As at Vimy Ridge, young Canadian guides and an on-site interpretation centre explain the battle and its aftermath. The site also includes three cemeteries maintained by the Commonwealth War Graves Commission and two divisional memorials, to the 51st Highland Division and the 29th British Division, of which the Newfoundland Regiment formed part. Beaumont Hamel became a Canadian National Historic Site in 1997. The bronze stag caribou is the emblem of the Royal Newfoundland Regiment. It stands on a mound, surrounded by rock and shrubs native to Newfoundland, defiantly facing in the direction of what was once the German lines. English artist Basil Gotto sculpted the caribou for the opening of the memorial in 1925. There are three other caribou memorials to Newfoundland's fallen in France, and one in Belgium. A replica of the Beaumont Hamel caribou stands in Bowring Park, St. John's.